U. CHICAGO (US) — A volcanic crater is offering clues to the composition of Earth’s early atmosphere, when carbon monoxide levels may have been tens of thousands of times higher than current concentrations. A team of American-Russian scientists studying the microbiology and geochemistry of Uzon Caldera in eastern Siberia, focused in part on microbes called anaerobic carboxydotrophs—that use carbon monoxide instead of oxygen—mostly for energy, but also as a source of carbon for the production of new cellular material. The carbon monoxide-based physiology produces microbial hydrogen, a component of certain alternative fuels, so biotechnological applications for cleaning carbon monoxide from certain industrial waste gases, and for biohydrogen production was also examined. Most of the carbon monoxide at the Kamchatka site was not bubbling up with the volcanic gases; instead “it was being produced by the microbial community in these springs,” calling into question the implications of a strong microbial source of carbon monoxide, both in the local springs but also for the early Earth. Earth’s early atmosphere contained hardly any oxygen but relatively large amounts of carbon dioxide and possibly methane. During the so-called Great Oxidation Event about 2.3 to 2.5 billion years ago, oxygen levels in the atmosphere rose from vanishingly small amounts to modestly low concentrations. “This important transition enabled a widespread diversification and proliferation of metabolic strategies and paved the way for a much later climb in oxygen to levels that were high enough to support animal life,” Colman says. The processing of carbon monoxide by the microbial community could have influenced atmospheric chemistry and climate during the Archean, an interval of Earth’s history that preceded the Great Oxidation Event. Previous computer simulations rely on a primitive biosphere as the sole means of removing near-surface carbon monoxide produced when the sun’s ultraviolet rays split carbon dioxide molecules. This theoretical sink in the biosphere would have prevented substantial accumulation of atmospheric carbon monoxide. Calculations suggest that carbon monoxide may have nearly reached percentage concentrations of 1 percent in the atmosphere, tens of thousands of times higher than current concentrations, exerting influence on concentration of atmospheric methane, a powerful greenhouse gas, with consequences for global temperatures. Carbon monoxide influenced atmospheric chemistry and climate during an interval that preceded the Great Oxidation Event. Furthermore, such high carbon monoxide concentrations would have been toxic for many microorganisms, placing evolutionary pressure on the early biosphere, Coleman says. Springs in California’s Lassen Volcanic National Park have a narrower range of acidic chemistries, yet microbial production of carbon monoxide appears to be widespread in both settings, he says. 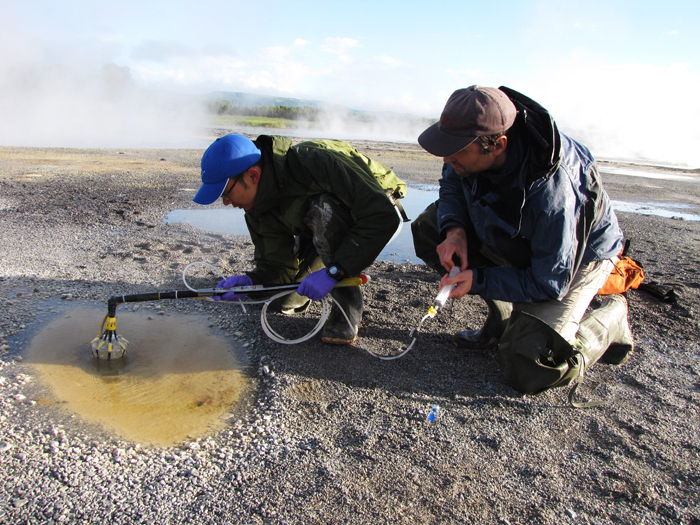 Some of the microbial life within the caldera’s complex hydrothermal system may survive in even more extreme settings than scientists have observed at the surface, Colman says. “One thing we really don’t know very well is the extent to which microbial communities beneath the surface influence what we see at the surface, but that’s possible as well. The National Science Foundation and the National Aeronautics and Space Administration’s Astrobiology Institute funded the research.